Decades ago, Sly And The Family Stone encouraged us to Dance To The Music. And we do, of course. Because is there another way? The band plays and we step out on the dance floor in whatever figure and fashion is suggested by the melody. But there is another way. Sitting around the turf fire at Doolin Music House, Christy tells another story. 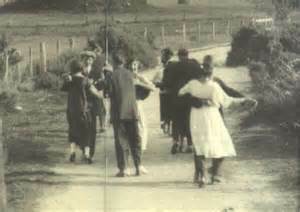 In the tradition of house dances the music is in service to the dancers. If the dancers determine that one among the musicians was not up to the task, they would ask him – and it was generally hims back then – to stop playing. And without question, they did. It was not a case of dancing to the music, it was playing music to the dance. I sit in the cacophonic noise of the media that surrounds us these days, especially prior to this election. The noise of social media. And it strikes me, pun intended, that more and more we are dancing to this music. Whatever steps this noise suggests. But we are the dancers. We are dancing our lives. What might be possible if we determined the music that best supports our steps? What might be possible if we shut off the discordant music?